Existing customer or design (repeat order)? Please click here instead. 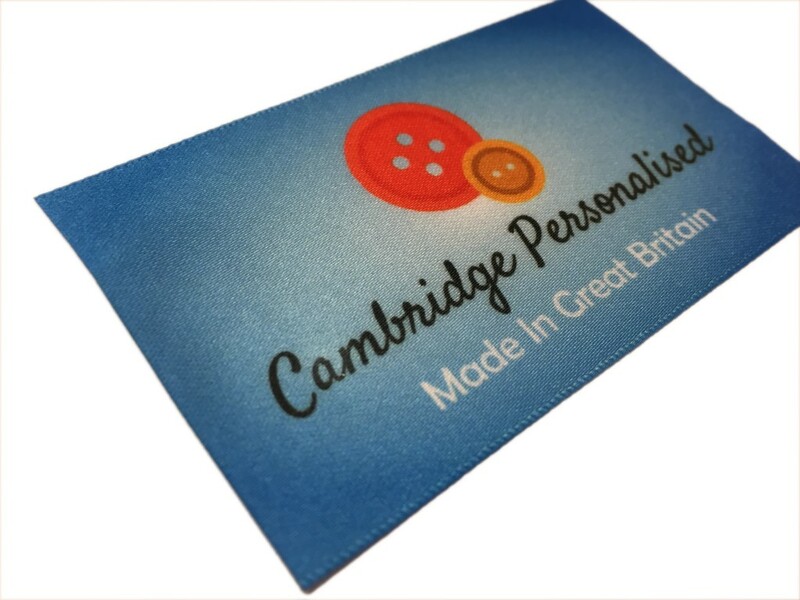 Personalised Folded or Flat Custom Sew In Fabric Labels - Add a professional finished touch to your handmade or craft items and more! Lots of sizes available, high-quality white double sided satin ribbon and full colour. 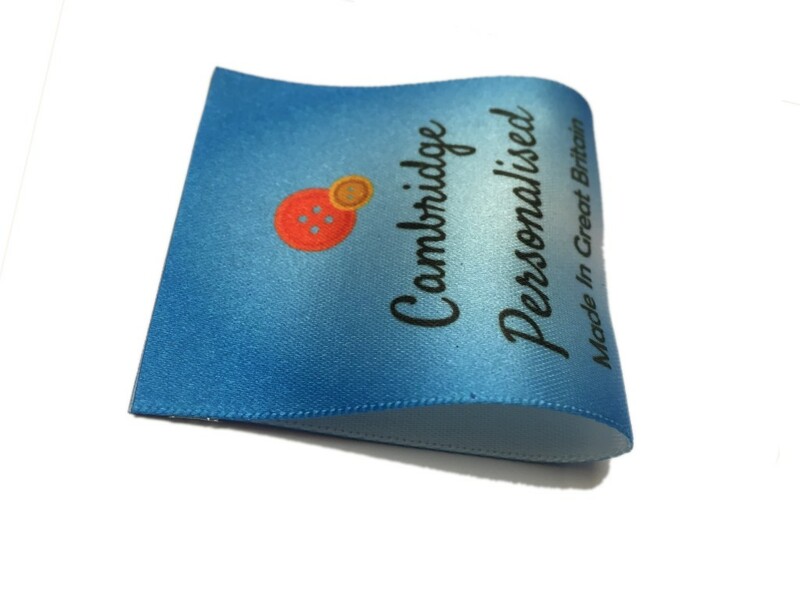 Our personalised fabric labels are available in several sizes in either flat or folded configuration to suit your needs, we use high-quality British made double sided white (the blue background on our product images is just an example) satin ribbon and each label is printed using our bespoke production process which means we can print your logo etc in full colour and it won't fade in the wash etc. All of our labels are cut and sealed at the point of production, this saves you time when sewing them in and also prevents any unwanted fraying. 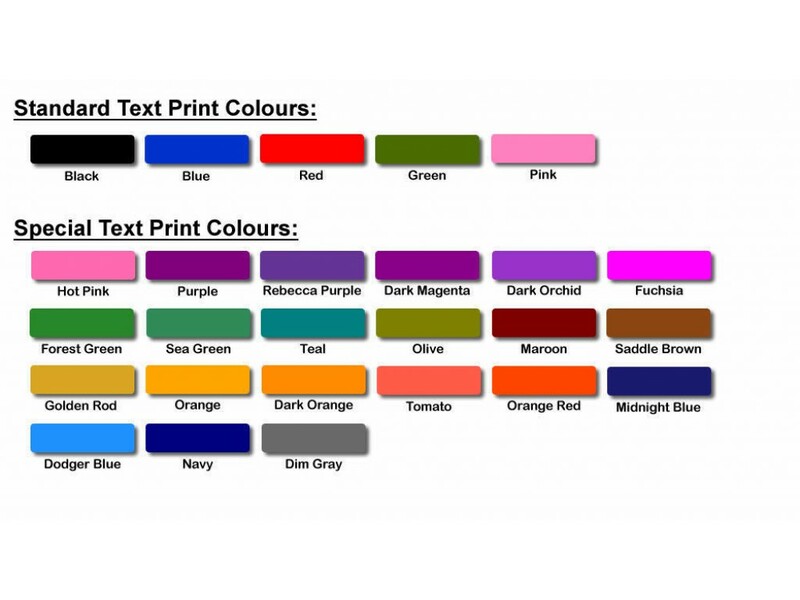 You can have a simple text design (let us know the text and print colour etc you would like) or a full colour logo it's entirely your choice, please note we don't create logos for you - your logo needs to be complete and suitable for printing e.g. not too small etc, before starting label production we will send you a preview of your design to ensure you are happy with it, once the design has been agreed we will begin production and ship them to you. 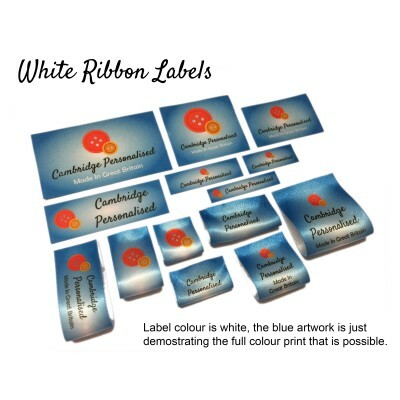 Over the years we have sold thousands of name labels for school children, care home residents and handmade craft items and have many happy customers which means you can be confident in our production processes, service and label quality. We save all designs which means when it comes to re-ordering more labels it's easy, just let us know you're a previous customer and we will confirm your design. 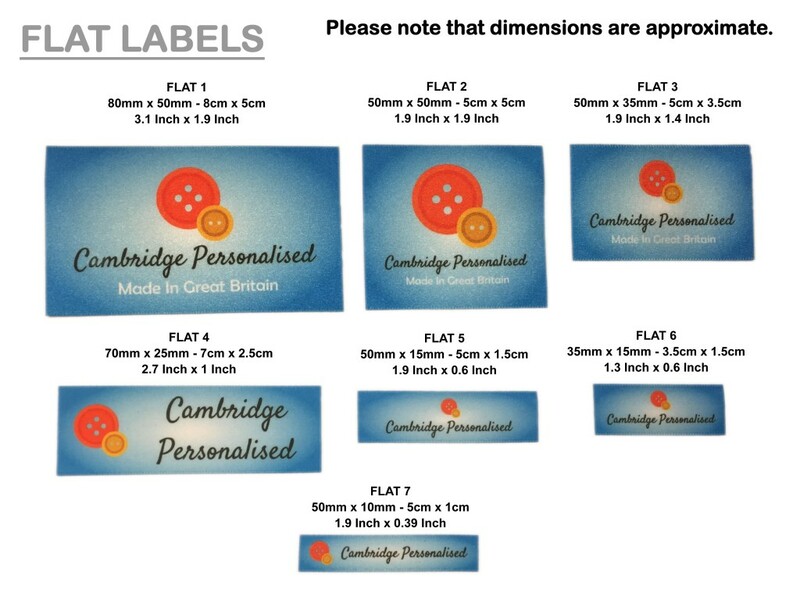 Please see the product images above for further label sizing in mm, cm and inches ("). All sizing is approximate, this means if you have a full colour logo you need to allow for some bleed area in the print - we also allow some extra room for sewing in. We have pack sizes of 20, 40 and 60 labels - if it's your first time ordering, please consider ordering a small amount to start with e.g. 20. Before ordering please ensure you have selected the correct size for your project e.g. Flat 2 etc. 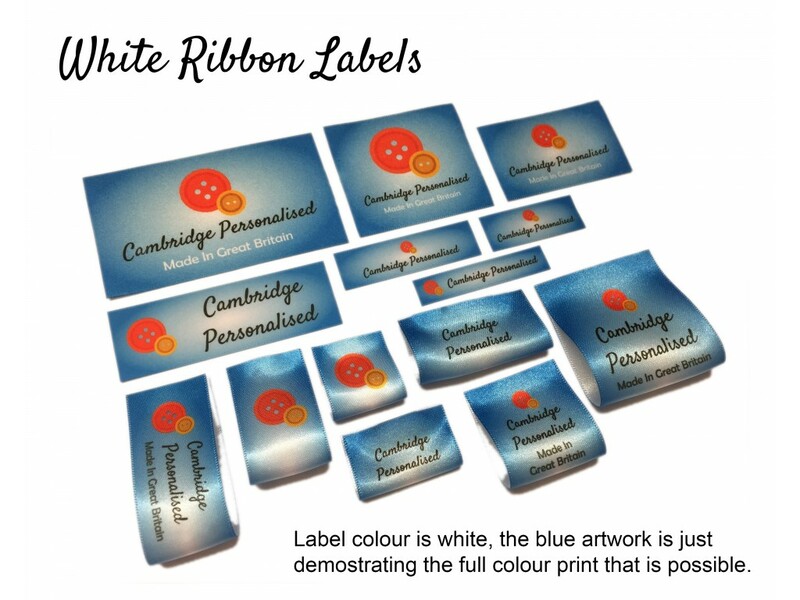 If you would like your logo printing it needs to be complete and suitable for printing e.g. not too small , you should contact us first ideally to confirm (we would appreciate that). Our pricing does not include any logo design services. Some labels can be portrait or landscape orientation, this is your choice but we will ask after your ordering if it's applicable. When you purchase a label pack e.g. 20 labels this is for one size only e.g. 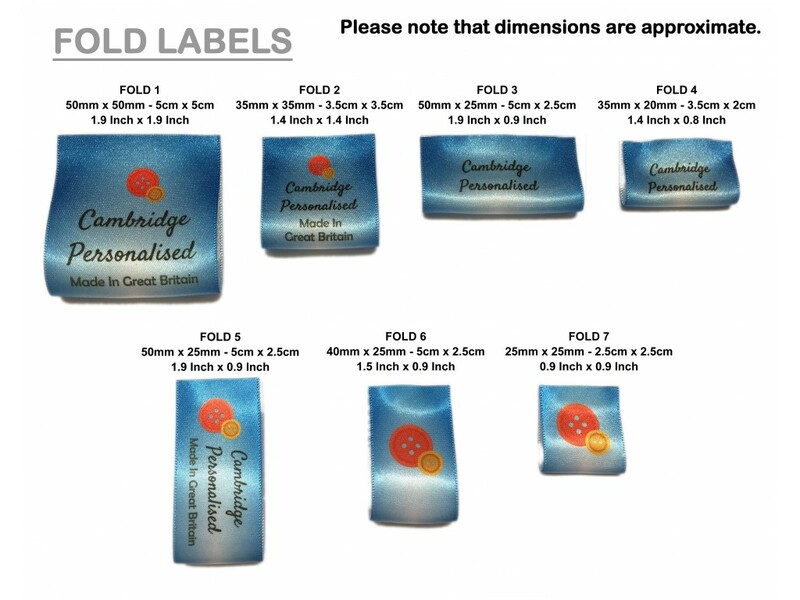 folded 3 and one design it cannot be split due to production constraints, however if you need multiple designs and labels please order the required packs and sizes - you can always send us a message about this for further information. We will send you an onscreen preview via email of your label design for your approval before starting production, then make and ship them ASAP. If you require a motif e.g. ball of wool or heart etc we have an extensive range of full colour motifs which are free (sewing, animals, hearts, wildlife and much more). If you have questions about ordering labels from us please contact us and we will be more than happy to advise you.